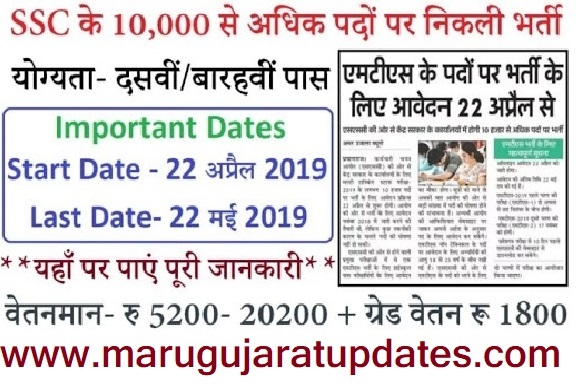 Staff Selection Commission (SSC) is going to release the recruitment notification for the post of Multi Tasking Staff (MTS) Non-Technical on 22nd April 2019. Interested candidates are advised to keep a track on the official website as well as for latest updates. As per media reports, through SSC MTS Recruitment 2019 Notification, it is expected that SSC will release around 10000+ vacancies for various posts under MTS Non Technical such as Peon, Safaiwala, Jamadar, Operator, Chowkidar etc. SSC MTS Recruitment 2019, Staff Selection Commission (SSC) has issued the official notification for the Multi-Tasking Staff (MTS) non-technical post. Candidates who are preparing for the SSC (MTS) exam can apply until May 22, 2019. This examination will be in two stages. It is expected that the SSC will release more than 10 thousand vacancies for different posts under MTS non-technical such as peon, cleaner, jamadar, junior Gestetner operator, janitor, etc. Candidates seeking to apply for SSC MTS Non-Technical 2019 Examination should be 10th class passed or equivalent from a recognized Board. The age of the candidates should be 18 to 25 years. As per the earlier released SSC MTS Recruitment Notification, the selection of candidates will be done on the basis of Multi-Tasking (Non-Technical) Staff Examination-2019 (Paper-I) and Multi Tasking (Non-Technical) Staff Examination-2019 (Paper-II). SSC MTS Exam for Paper I will be conducted from 02 August to 06 September 2019 while the SSC MTS Paper II is scheduled on 17 November 2019. Candidates will be shortlisted for the MTS Paper II on the basis of their performance in MTS Paper II.